The CRISPR-Cas9 “DNA scissors” technique was a breakthrough in the field of microbiology. It allows scientists to target specific genes in a DNA strand and edit parts of the genome by cutting, removing, adding sections of the DNA sequence. The two key molecules in the CRISPR-Cas9 system that modify the DNA are the Cas9 enzyme, which cuts the strands of DNA at a specific location in order to add or remove sections, and the guide RNA (Ribonucleic acid), which finds and binds to a specific sequence in the DNA. With various RNA types, any DNA can be cut. The CRISPR-Cas9 system is simple – any researcher with knowledge of molecular biology will be able to learn the method in just a couple of months. Produce that has already been created using the CRISPR-Cas9 method include soybeans that no longer produce harmful trans fat, but instead produce a healthier mix of fatty acids, potatoes that do not turn brown after removing their skin, mushrooms that live longer than their usual life expectancy, and corn with kernels that do not soften. Choulika claims that genetically edited vegetables are different from GMOs (Genetically Modified Organisms). GMOs have their DNA modified using bacteria to expose the desired trait, but this is problematic because DNA from the bacteria may remain in the plant during the modification process. There are risks involved as it is a process that cannot occur naturally. Although side effects or problems have yet to be reported, many countries in Europe have prohibited the cultivation of GMOs. CRISPR organisms have no health controversies like GMO does, which is what gains its traction in the world today. In the CRISPR-Cas9 method uses only the DNA of the plant itself. CRISPR also has an advantage in that the “scissors” can cut specific desired sections of the DNA, meaning that plants with any desired characteristic can be produced simply by knowing the roles of each DNA strand. Unlike GMOs, CRISPR plants have yet to be regulated in countries such as the United States, England, and China. The CRISPR scissors have also been used in the animal industry. Professor Kim collaborated with Professor Xi-jun Yin of Yanbian University (Yanji, China) to produce ‘double-muscled’ pigs, which bear significantly greater muscle mass than usual pigs. 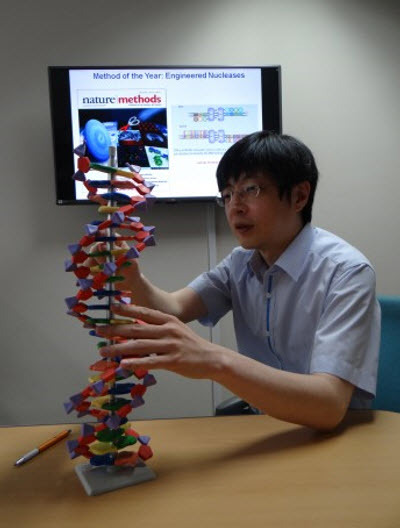 Using DNA scissors, the research team headed by Professors Kim and Yin cut the myostatin gene (MSTN), which inhibits the growth of muscle cells beyond a certain amount. These ‘double-muscled’ pigs have higher protein content and less fat. Other modified animals have been produce such as sheep with different colours of wool, which would make the process of dyeing wool no longer necessary.